James Petigru Boyce (1827-1888) was the son of Ker Boyce and of Ker’s second wife, Amanda Jane Caroline Johnston. James was named after a political friend of Ker’s, James Petigru, a Unionist Democrat. James’s sister, Mary Miller Boyce, is my wife’s second great grandmother, and James is therefore my wife’s second great grand uncle. Ker and Amanda were from a Presbyterian background. But Ker’s first wife, Nancy Johnston, was Amanda’s sister, and the Presbyterians therefore refused to witness the marriage. The Baptists however saw no problem and witnessed the marriage. 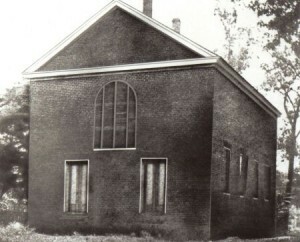 Ker never joined the Baptist church but was sympathetic to it. After hearing a sermon by Basil Manly Sr. on the death of his child, Amanda was converted and became a devout Baptist. Ker Boyce was the wealthiest man in South Carolina; James had an excellent education and developed cultivated tastes in the arts. As a boy James was heavy set, which limited his participation in sports, although he loved archery, chess, and billiards. James was fond of jokes, especially practical jokes. The upcountry Scots-Irish culture of Newberry, which he inherited, will be the subject of other blogs. He worked in his father’s dry goods store as a teenager and learned the practicalities of commerce. In May 1845 James, although not yet a church member, was present at the convention in Augusta, Georgia, which formed the Southern Baptist Convention. The break was occasioned by the differences over the liceity of slavery. Some Southerners, stung by the reproaches of their Northern co-religionists, started to defend slavery as a positive good, and North and South parted ways. James was a voracious reader. He attended Charleston College 1843 to 1845 and then entered Brown University. Brown was a Baptist foundation, and under President Wayland was deeply interested in the spiritual welfare of its students. The college held a fast and students prayed for one another. Wayland was also an abolitionist. During the spring vacation of 1846 James returned to Charleston by coastal steamer. On the way, he stayed in his stateroom reading the Bible and came under conviction of sin. On April 22, 1846 he was baptized in Charleston. He returned to Brown and worked for revival among the students by means of prayer and argument. In 1847 he graduated from Brown, and determined to be a minister. He edited the Southern Baptist 1848-1849; an edition early in his editorship contained an important announcement: on December 20, 1848 James married Lizzie Llewellyn Ficklen, whom he had met at a wedding in Washington, Georgia, the previous year. James attended the Presbyterian Theological Seminary at Princeton from 1849 to 1851. There he studied under the Calvinist Charles Hodges. He was called to the ministry and ordained in 1851. Spurgeon called Boyce “the greatest living preacher.” James became pastor of the Baptist Church of Colombia in 1851. Both the building and the congregation were small. In 1853 he persuaded the congregation to allow a melodeon, and then hired a choir leader. In 1854. James’s father Ker died while visiting James in Columbia, and James became the executor of the estate. James resigned his ministry to become a professor at Furman University, where he taught 1855-7, but maintained his connection to the Columbia church and pledged $10,000 to the construction of a new building. At its dedication, James alluded to the Baptist habit using their buildings for unspecified “sacrilegious” (i.e. profane} purposes. This building would soon host an important political event. 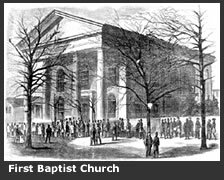 The First Baptist Church in Columbia, South Carolina is a Greek Revival building built in 1856.A convention met here on December 17, 1860 which voted unanimously for South Carolina to secede from the United States, leading to the American Civil War. 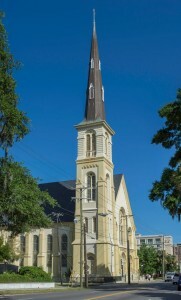 The Boyce family also helped found and pay for the construction of the Baptist Church on Citadel Square in Charleston. This new congregation emerged in the mid-nineteenth century as the result of an “interesting revival” which took place in the life of First Baptist in the Spring of 1854. While First Baptist witnessed the conversion of many persons to Christ, a few of its members (twelve in number) were also stirred with evangelistic concern for the unreached persons living in the growing “Upper Wards” of the city. This burden gave birth to a vision for a new church. On the 27th of May, 1854, five couples along with two other men from First Baptist requested letters of dismission from First Baptist so that they might establish a new fellowship in the upper part of the city north of what was once called “Boundary Street” but is better known today as “Calhoun.” On the 29th of May, 1854, this small group along with one additional couple from the Wentworth Street Baptist Church organized themselves into a church. Two days later, the new fellowship was publicly recognized in the lecture room of the First Baptist Church. The young Rev. James P. Boyce, son of the prominent and wealthy Ker Boyce of Charleston and future founder and preached the dedication sermon. 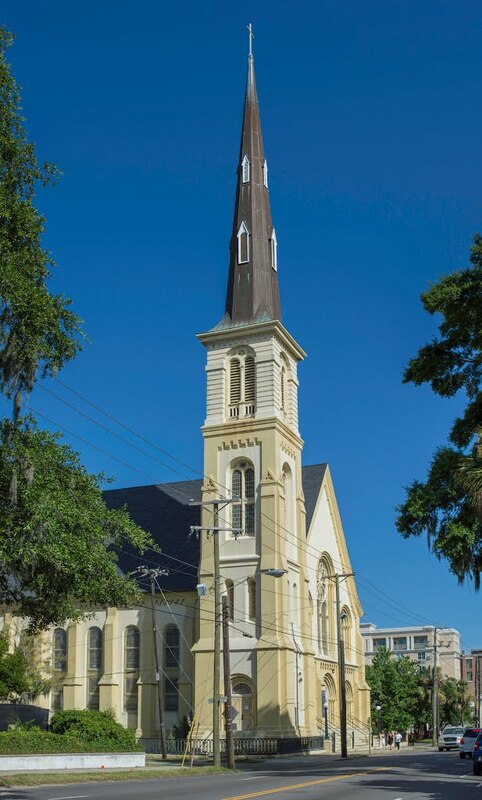 This beautiful edifice, built to seat 1,000 persons, belonged to a congregation which just two years earlier was fourteen in number and, at the time of dedication, had a mere membership of two hundred and seventeen, one hundred and nineteen of whom were slaves! Boyce and his friend Basil Manly inherited the “Charleston tradition,” that prized theological orthodoxy and an educated ministry. In 1858, one year before Southern Seminary opened for classes, a committee comprised of James P. Boyce, Basil Manly Sr., Basil Manly Jr., and John Broadus completed the Abstract of Principles. This confessional statement– the first crafted by a group that was specifically Southern Baptist– would serve as the theological foundation for all faculty members of Southern Seminary. These principles would not bind upon the students, but the seminary would assure that all professors at the seminary taught in accord with the principles, which were a confession of the beliefs that Baptists held. The first principle was the centrality and authority of Scripture. I. The Scriptures of the Old and New Testaments were given by inspiration of God, and are the only sufficient, certain and authoritative rule of all saving knowledge, faith and obedience. All the principles were in the tradition of Christian orthodoxy, with a Calvinist tinge. V. Election: Election is God’s eternal choice of some persons unto everlasting life-not because of foreseen merit in them, but of His mere mercy in Christ-in consequence of which choice they are called, justified and glorified. It should be noted that from the earliest years of Baptist history there have been two schools of thought pertaining to the theological issue of election. Some Baptists, frequently called “Particular Baptists”, felt strongly that the Bible teaches election – i.e. that only those “particular” individuals whom God chooses can be saved. Strongly influenced by the Reformed theology of John Calvin – as well as English Puritanism – Particular Baptists believed that if you were of God’s elect, then nothing could prohibit your salvation. And if you were not of God’s elect, then nothing that you could do would bring you salvation. On the other side of the issue were the General Baptists. General Baptists were influenced by the Armenians and many Anglicans. They believed that all people had the freedom to choose or refuse salvation. God’s salvation was offered “generally” to all men and women. Boyce felt the after-shock of the “election” debate and was molded by the Particular Baptist leanings of his church. Later, while studying at a Presbyterian school, Princeton University, Boyce was profoundly influenced by a professor, Charles Hodge, who strongly espoused the Reformed theology of election. Consequently, Boyce became a strong advocate of the doctrine of election. Evidence of this is seen in his book Abstract Of Christian Theology (1877). And, as rofessor and President of Southern Seminary, Boyce’s Reform views weighed heavily in the authorship of the Abstract of Principles. But it seems to me that the Principle avoids taking sides on the question of Double Election. That is, does God choose some to be saved and some to be damned. The Calvinist doctrine of election and vigorous evangelization seem to be in tension. But Boyce accepted both. Like Charles Spurgeon, Boyce often lamented the inroads that Arminianism was making on Baptist life. He saw the fate that awaits the Church when it trades the sovereignty of God for the sovereignty of man. Boyce also warned against the dangers of hyper-Calvinism that had taken root among Baptists in the south in the form of Primitive or Hard-Shell Baptists. He was a Calvinist who was so committed to evangelism that he offered the Seminary grounds to D.L. Moody when he brought his tent to Louisville. XVIII. Liberty of Conscience God alone is Lord of the conscience; and He hath left it free from the doctrines and commandments of men, which are in anything contrary to His word, or not contained in it. Civil magistrates being ordained of God, subjection in all lawful things commanded by them ought to be yielded by us in the Lord, not only for wrath, but also for conscience sake. The persecution of Baptists by Anglicans in pre-Revolutionary Virginia strongly influenced Jefferson’s ideas on religious liberty. The Abstract of Principles remains in force among Southern Baptists and therefore enabled a major change in the nature of the Seminary in in 1990s, as we shall see. We have been dependent in great part upon the criticism of Germany for all the more learned investigations in Biblical Criticism and Exegesis, and that in the study of the development of the doctrine of the Church, as well as of its outward progress, we have been compelled to depend upon works in which much of error has been mingled with truth, owing to the defective standpoint occupied by their authors. The history of religious literature, and of Christian scholarship, has been a history of Baptist wrongs. We have been overlooked, ridiculed and defamed . . . Historians who have professed to write the history of the Church, have either utterly ignored the presence of those of our faith, or classed them among fanatics and heretics. 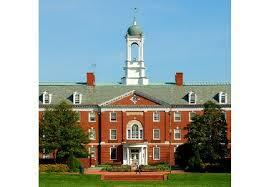 But the new seminary had to close in 1862, as its students were not exempted from the Confederate draft. James was a slave owner. In 1860 he owned twenty-three slaves. 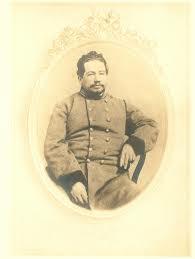 James joined the Confederate Army as a chaplain for six months. I believe I see in all this the end of slavery. I believe we are cutting its throat, curtailing its domain. And I have been, and am, an ultra pro-slavery man. Yet I bow to what God will do. I feel that our sins as to this institution have cursed us, – that the Negroes have not been cared for in their marital and religious relations as they should be; and I fear God is going to sweep it away, after having left it thus long to show us how great we might be, were we to act as we ought in this matter. His personal relations to slaves and former slave were courteous. Before the war a family “maid” fell in love with a master-builder “servant” (notice the language that the Boyces used) but the marriage could come about only if James bought the servant, which he did, and enabled the marriage. James remained on good terms with this couple after Emancipation and was hosted by them at their house in Memphis. James was appointed by President Johnson to South Carolina constitutional convention during Reconstruction. As required by the North for readmission to the Union, South Carolina passed a law outlawing slavery. As historians have remarked, the Southerners who defended slavery on Biblical grounds had stronger arguments than Northern abolitionists. It is clear, as the Southerners claimed, that in the Bible slavery is simply accepted as a fact. There is no indication that it is innately immoral. However, nor does the Bible require slavery. The Quakers developed a strong aversion to slavery. Orthodox Quakers had difficulty responding to Southern slavery defenders in biblical grounds. Some Quakers were therefore attracted to Hicks and his doctrine of the Inner Light, which relied for the proper interpretation of Scripture on the Inner light of the Holy Spirit. By this Inner light Quakers could see the evil of slavery. It is true, as Southerners claimed, that slavery is simply accepted as a fact in both the Old and New Testaments. It is also true that polygamy was also simply accepted as a fact in the Old Testament, and there in nowhere in the New Testament an absolute condemnation of polygamy. It is doubtful if southerners would have accepted polygamy. But why not? It could be justified and in fact held-up as God-ordained by using the same hermeneutics that justified slavery. Over the course of centuries Jews had come to see polygamy as not innately immoral but as an institution which distorted the relationship of man and woman. A man was supposed to have one wife, just as The LORD had one spouse, Israel. Paul would take this analogy up and apply it to Christ and the Church. Acceptance of polygamy would therefore be a regression and a dimming of the light that God had given to the Church. Similarly, slavery died out in the supposedly Dark Ages. Slavery had died out as societies became Christians had slowly come to see that slavery compromised the dignity of a human being, that it tended to make the owner forget the humanity of his slave. It was not fitting that a Christian should own a fellow Christian.The Popes later allowed it to Christians as an emergency response to Moslem enslavement of Christians. In the South slave owners who underwent a conversion and joined a church that forbade the ownership of slaves sometimes faced a dilemma. In some cases, as in New York, the State had to approve manumission and would not approve it unless the slave was old enough and well trained enough to support himself. In the South, freed slaves often had to leave the state. If a slave had a wife and children on a neighboring plantation, and he was freed, he had to leave the state. So some slaves asked their owners not to free them, and the owners were in a quandary. Their church forbade them to own slaves, they did not want to own slaves, but the slave did not want to be freed, for excellent reasons. James thought slavery an acceptable institution, provided that slaves were given Christian instruction and their families were respected. He did not describe slavery as “owning” another human being – an expression and concept repellent in itself, but in having the right to the involuntary labor of another human being – and that human being’s descendants in perpetuity. Many white colonists came to the colonies as indentured servants, and such a state could be inherited but it was not perpetual. Moreover, the two main motives to overcome the human reluctance to work are financial hardship or corporal punishment. Slaves could usually be motivated only by the second, which led to many horrors. As bad as the situation of the wage slaves of the industrial North, was, the situation of black slaves in the South was worse. Freemen were not subject to corporal punishment not of having their families broken up at someone else’s whim. Emancipation was greeted with joy by slaves, and there was no nostalgia for the days of slavery. James was at his house in Greenville at the end of the war. Federal troops looted the city. His elegant house attracted attention, and it was ransacked by the Yankees. Looking for jewelry and silver that they had been told were there, and unable to find any, they held a gun to Boyce’s head and demanded under threat of death, the location of the treasures. Boyce replied that he had sent them all away the day before with his brother and could not tell them where they were because he did not know, He instructed his brother simple to leave with the reassures and not tell him where he went. After many threats, they were finally convinced. The left, taking everything they could. After the war James devoted himself to the seminary. The South was impoverished, and it was difficult to raise money for charitable purposes. James’s personal fortune had been badly hurt by the war. The New York business had failed at the start of the war, and he had put money into Confederate and State bonds, which were worthless. With great difficulty he moved the Seminary to its current location in Louisville and assured its survival. Boyce had to deal with the ripples of the Higher Criticism that reached the seminary. He hired his friend C. H. Toy to teach at the seminary. Dr. Toy had been influenced by German higher critical methods. In his classroom, Toy began to undermine the biblical account of creation, teaching Darwinism and higher criticism. Boyce realized the danger of this teaching and insisted that Toy teach the Old Testament history as it is written in Scripture, which Toy agreed to do. Nevertheless, convinced of the validity and usefulness of his position, Toy submitted a defense of his beliefs, along with his resignation, to the trustees of Southern Seminary at the 1879 Southern Baptist Convention annual meeting in Atlanta. The trustees accepted his resignation. Boyce did not oppose Toy’s resignation, but suffered great personal grief at being distanced from a treasured friend that had seemed so intellectually promising. He maintained cordial and affectionate relationships with those with whom he disagreed in theology. His work for the Seminary took its toll on James. In 1886 James and his family went to Europe for his health. But he continued to fail. He was dying in Paris, and his doctor advised removal to the countryside. This did not help. James died in Pau, France, on December 28, 1888. 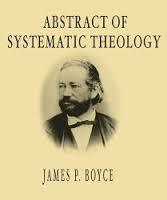 James wrote a textbook of theology, The Abstract of Systematic Theology, which is still in print. Boyce explains theology through a Calvinist lens, which in turn was influenced by mediaeval voluntarism and St. Augustine. He cannot create a being whose nature is sinful…. If it be asked why he can do none of these things, the answer is, because his own nature is to him the law of what he does, as well as what he wills and what he is. He is not just and holy because he wills to be so, but he wills to be just and holy because he is so. His will does not make his nature, but his nature controls his will. Therefore Boyce rejects extreme voluntarism, but 1. His placing of God’s omnipotence before God’s reason and love introduces a distortion. 2. He omits the only definition of God that Scripture contains: God is love. To say that God is love (which is another way of saying that He is Trinitarian and the inner life of God is friendship among the Persons), as well as just and holy, before treating of his power changes the focus of theology. It changes the tone and focus to say that God is just and holy and above all loving not because he wills to be so, but because such is his nature: God is Love. James sketched the twofold path to seminary training : one for ministers who sought the fundamentals of Christian doctrine and another for those who sought advanced studies to defend and explain the Christian faith, This seems to have continued to be the pattern among Southern Baptists. James’s insistence on the confessional nature of the seminary also has continued. The Principles remained in legal effect at Southern Baptist Seminary, and enabled the conservatives to recover control of the seminary in the 1990s, although they had to add to teh Principle to deal with modern problems. In 1993, the seminary’s current president R. Albert Mohler, Jr. came into office re-affirming the Seminary’s historic “Abstract of Principles,” part of the original charter of Southern created in 1858. The charter stated that every Professor must agree to “teach in accordance with, and not contrary to, the Abstract of Principles hereinafter laid down” and that “a departure” from the principles in the Abstract of Principles would be grounds for resignation or removal by the Trustees. Dr. Mohler…required that current professors affirm, without any spoken or unspoken reservations, the Abstract of Principles. Professors were also asked to affirm the “Baptist Faith and Message” of the Southern Baptist Convention, since Southern is an agency of the SBC. An overwhelming majority of faculty affirmed the Abstract of Principles, but declined to affirm some of the doctrines stated in the “Baptist Faith and Message,” which had recently been amended to bring it in line with more conservative positions held by the current leadership of the SBC. In the wake of the subsequent dismissal or resignation of a large percentage of the faculty, Southern has replaced them with new professors who agree to adhere to the “Baptist Faith and Message” in addition to the seminary’s Abstract of Principles. James’s suspicions of the Tubingen school, coupled with a appreciation that the Scriptures taught using popular, non-scientific language and concepts, seems to have become the norm among Southern Baptists and largely preserved them from the inroads of Modernism while rejecting extreme fundamentalism. The Catholic Church has not been so fortunate: Cardinal Kaspar sees the nature miracles in the New Testament a simply stories concocted by later Christians to make theological points. James Boyce, a wealthy and cultivated man, also helped raise the aesthetic standards of Baptist worship in architecture and music. This was also one of the goals of the descendants of his brother-in-law, Henry Allen Tuttle, who had noteworthy and cultures ministers among his descendants. When cultures collide, sometimes they borrow good ideas from each other, and sometimes bad ideas. The encounter of Islam and the Christian West has given us algebra, but we have also taken over some of the unlovelier products of Islam. Islam spread the idea of jihad as meaning not only an interior struggle against evil but physical, military operation against the enemies of true religion, against the infidel. The West thought this was a good idea and developed the idea of a crusade, a war that was not simply just but holy, to counter the jihad that had conquered large sections of the Christian world. Christians killed in the name of God. Islam, submission, developed the idea that God was absolutely unknowable, that our only response to him was to submit to his will, that is will was arbitrary, that all occurred because of his will, and that he could change his will as he pleased because it did not express his nature, which is absolutely unknowable. Hydrogen and oxygen combine to produce water because God wills it; the independence of secondary causes was neglected. God could change the moral law, and command what he had forbidden, and forbid what he had commanded. Our only duty is to submit to his inscrutable will. The lines of influence are not clear, but I suspect that nominalism and voluntarism in the West are the result of an encounter with this Islamic idea. It sounds so pious. Slavery had died out in the West, but then Islamic slavers – the Barbary pirates – enslaved perhaps a million Europeans, a process that continued until the nineteenth century. In desperation the papacy allowed slavery to revive in Catholic lands. And now the Norwegian terrorist Anders Behring Breivik has, as the newspapers point out, issued a manifesto that is the mirror image of Al-Queda. Islamic terrorism has created Christian terrorism. A recent survey of the values of European youth confirmed that young men are less religious than young women – no surprise there. The report is in somewhat opaque sociological language, but it also indicates that young men are more hostile than women to other religions, even if the men do not believe in the traditional religion of their country. That is, the young men may be indifferent or hostile to Christianity, but they are even more hostile to intruding foreign religions, such as (the report did NOT go on to say) Islam. In fact, historically European men have been hostile to the clerical-feminine manifestations of their religion. Instead men feel an identification with the religious community, whose identity they have celebrated and defended in their own way. Mussolini was asked to allow the construction of a mosque in Rome; he said certainly, as soon as a Catholic church was built in Mecca. And so we have a Norwegian, who seems to have shown little interest in prayer, liturgy, or other clerical-feminine manifestations of Christianity, observes Al-Queda and decides he is going to defend the Christian identity of Europe by provoking a civil war between Christianity and Islam. Notre Dame did not anticipate the level of criticism it is getting for its invitation to Obama, criticism not only from grass-root pro-life activists, but also from bishops and cardinals. Those who defend the invitation have been rather lame. They claim that the invitation does not show an approval of Obama’s positions on life; this may be true, but it certainly shows that Notre Dame does not regard Obama’s positions as beyond the pale. Notre Dame would never have invited George Wallace as a commencement speaker. Obama knows very well that his presence at Notre Dame is a political plus, demonstrating that the leading Catholic university in the U. S. finds his positions at least tolerable, even as he dismantles conscience protections for health workers – many of them Catholic – who object to being involved in abortions. Notre Dame claims that the invitation is an opening to dialogue. But a commencement speech is not a debate. A debate would have been a wonderful idea, and Obama would never have accepted it. It would have been political poison. But the primary defense is that Obama’s visit will acknowledge Notre Dame’s importance. Over at the dotCommoweal site, Margeret Steinfels and others do not want the Catholic Church to become a sect, a ghetto, marginalized. The proffering of the invitation to Obama and the joy at its acceptance were a sign of social status insecurity. Would Harvard have squealed for glee if the President accepted an invitation to speak, or Oxford if the Prime Minister came, or the Sorbonne if Sarkozy came? No. These universities rightfully regard mere politicians as beneath them in status. Evelyn Waugh described the Catholic Church in America as a tribal institution of the Irish, and much of its strength lay in its helping immigrants establish themselves in America. The church was an instrument of social climbing. The process continues: everything that keeps back advancement in society is abolished, ignored, or downgraded. Both sides of the Obama controversy, however, demonstrate a Catholic tendency that does no good to the Church: the tendency to see everything in terms of will and obedience, that is, in the context of a voluntaristic approach to morality. Attempts to find a way in canon law to block the invitation are one sign of this attitude; but the defenses of Obama also demonstrate the influence of voluntarism. The defense runs as such: Obama does not share Catholic beliefs about protecting human life; therefore he is not doing anything wrong when he advances abortion and experimentation on human embryos. We should therefore respect his conscience. In one of his books, Cardinal Ratzinger showed the fallacy of this. He recounts a conversation with an unnamed theologian (I suspect Hans Küng) about conscience. The theologian said it was well that Europeans had an invincible ignorance about sexual morality. If they accepted Christian teaching they would still fornicate and commit adultery, but as it was they now did these actions without guilt, because they were acting according to their consciences. Ratzinger asked if the same principle applied to the SS men who killed Jews because they thought they were doing a good act in cleansing Europe of a Jewish poison. The theologian replied. Yes, the SS men were acting in good conscience and were guiltless. Ratzinger thought there was something very wrong with this approach. Briefly, the position of Ratzinger (and of Aquinas and the Fathers) is that God commands or forbids things through a promulgated moral law because those things are good or bad in themselves. Even if one acts in ignorance of the moral law, one does evil, even if it without the guilt of a conscious transgression of a promulgated law. As the Psalmist prays: From my unknown faults deliver me, O Lord.